I didn't post the bootleg trailer, but now that they've officially released it, I figured I might as well. I know, you're probably saying, what's with all the comic movies news and trailers this week? Well what do you expect, with Comic Con starting this week? I have very mixed feelings about the reboot. At first I was not interested purely out of the ridiculousness of starting over so soon, but there's just been way too many interesting draws to the film. Rhys Ifans as The Lizard? Martin Sheen as Uncle Ben? Yeah, I'm up for that. But I was really hoping we could skip the origins replay. I get tired of having to wait through that in every franchise. And now we have to see it twice? Eesh. So what do you think, are you interested in the reboot? My son will want to see it more than likely. In too much of a rush right now to view the trailer...but I'm sure it's interesting! Spiderman is just a wee bit creepy to me....I hate spiders and all that stuff...lol. It didn't need to be done so soon. But who knows? Look how well the Batman reboot turned out. 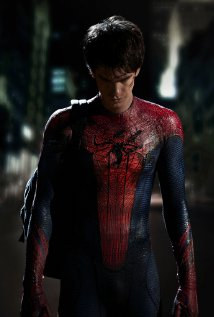 I preferred Tobey, but I'm not much into "boy movies" ha ha. I've been saying "boy movies" since Raiders of the Lost Ark days. In fact, I'm going to blog about. Thanks for the inspiration! I like going through the city in first person. made me feel like I was Spiderman.